In the 1850 census of Greene County, Lemmon Lyntch, 32 year-old white farmer, and William Conner, 18 year-old mulatto. William was likely an apprentice. In the 1860 census of Hookerton, Greene County, William Conner, 28, and Argent Conner, 50, both mulatto. 2 Cav. U.S.C.T. William Conner. Co. A, 2 Reg’t. U.S.C.T. Cav. appears on Company Descriptive Book of the organization named above. Description: age, 33 years; height, 5 feet 8 inches; complexion, tawny; eyes, dark; hair, black; where born, Green County, NC. Enlistment: when, 22 Dec 1863; where, Newberne; by whom: Capt. Hourd; term, 3 years. Remarks: Promoted to Company Farrior 1 Nov 1864. Tell them if I am Black I am free born American & a revolutionary soldier & therefore ought not to be thrown entirely out of the scale of notice. 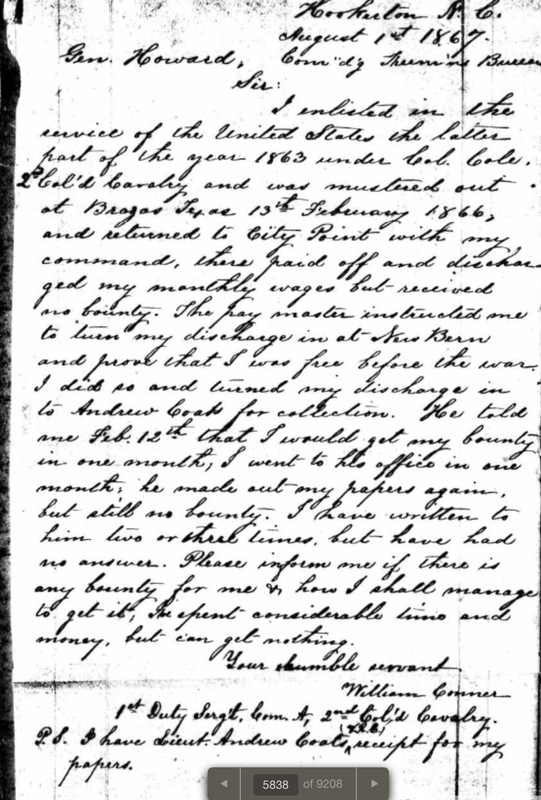 Letter from John Chavis to Senator Willie Mangum, March 10, 1832; Willie P. Mangum Papers, State Library of North Carolina. Some have resolved to move to Africa. GENTLEMEN, I have the honor to submit a brief report of my proceedings since I left Washington early in March, with such suggestions and reflections as may occur during the relation of the incidents and observations of my tour up to this date. North Carolina will stand forth a powerful and decided friend of the scheme of Colonization. … The Society of Friends in this State, early turned their thoughts to the plan of African Colonization, encouraged the free people of colour under their protection to emigrate to Liberia, and supplied a generous fund to defray the expenses of such as consented to remove thither. Several hundreds, once under the guardian care of this Society, are now enjoying the freedom and privileges of that Colony. There are still in North Carolina numerous free coloured persons of respectable intelligence and moral character. Those in Fayetteville, Elizabethtown, and Wilmington, have probably no superiors, among their own class, in the United States. After careful reflection, some have resolved to remove to Africa, and others are anxiously directing their thoughts to the subject. Louis Sheridan, with whose reputation and views the Board are partially acquainted, is a man of education, uncommon talents for business, a handsome property, and the master of nineteen slaves. His determination to emigrate to Liberia with a company of from forty to sixty of his relations and friends has already been announced. The public meetings held in Raleigh, during my visit, were well attended and of much interest, and addressed with spirit and effect by several of the citizens of that place. Collections were made for the benefit of the Society. The Resolutions adopted by the citizens of Raleigh are before the public. Excerpt from Secretary’s Report, The African Repository and Colonial Journal 13, No. 7 (July 1837), pages 201-206. Remaining in the Post Office at Fayetteville, N.C., July 7, 1862. When called for please say they are advertised. … Jordan T. Artice … John Cowan … Jo Hagans … Sophia Martin … JAS. G. COOK, P.M.
Carolina Observer, Fayetteville, 7 July 1862.